The 3rd Armored Division's shoulder sleeve insignia. The 3rd Armored Division ("Spearhead") was an armored division of the United States Army. Unofficially nicknamed the "Third Herd," the division was first activated in 1941, and was active in the European Theater of World War II. The division was stationed in West Germany for much of the Cold War, and participated in the Persian Gulf War. On 17 January 1992, in Germany, the division ceased operations. In October 1992 it was formally inactivated as part of a general drawing down of forces at the end of the Cold War. The 3rd Armored Division was organized as a "heavy" armored division, as was its counterpart, the 2nd Armored Division ("Hell on Wheels"). Later, higher-numbered U.S. armored divisions of World War II were smaller, with a higher ratio of armored infantry to tanks, based on lessons of the fighting in North Africa. 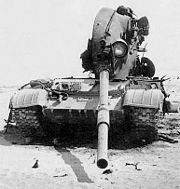 As a "heavy" division, the 3rd Armored possessed two armored regiments totaling four medium tank battalions and two of light tanks (18 companies) instead of three tank battalions containing both (12 companies), 232 medium tanks instead of the 168 allotted a light armored division, and with attached units numbered over 16,000 men, instead of the normal 12,000 found in the light armored divisions. Each division type had an infantry component of three mechanized infantry battalions. The division's core units were the 36th Armored Infantry Regiment, the 32d Armored Regiment, the 33d Armored Regiment, the 23d Armored Engineer Battalion, the 83d Armored Reconnaissance Battalion, and the 143d Armored Signal Company. During World War II these were organized operationally into task forces known as combat commands A, B and R (Reserve). In addition to the core units, a number of other units of various kinds were attached to the division during various operations. The division was activated on 15 April 1941 at Camp Beauregard, Louisiana. In June 1941, it moved to Camp Polk Louisiana (now Fort Polk). On 9 March 1942, it came under Army Ground Forces and was assigned to the II Armored Corps. In July 1942, it was transferred to Camp Young, CA and from August to October 1942, took part in maneuvers at the Desert Training Center. It left Camp Young in January 1943 and moved to the Indiantown Gap Military Reservation, Pennsylvania. The first elements of the 3rd Armored in France saw combat on 29 June, with the division as a whole beginning combat operations on 9 July 1944. During this time, it was under the command of VII Corps and XVIII Airborne Corps for some time, and assigned to the First Army and the 12th Army Group for the duration of its career. The division "spearheaded" the US First Army through Normandy, taking part in a number of engagements, notably including the Battle of Saint-Lô, where it suffered significant casualties. After facing heavy fighting in the hedgerows, and developing methods to overcome the vast thickets of brush and earth that constrained its mobility, the unit broke out at Marigny, alongside the 1st Infantry Division, and swung south to Mayenne. The engineers and maintenance crews took the large I-Beam Invasion barriers from the beaches at Normandy and used the beams to weld large crossing rams on the front of the Sherman tanks. They would then hit the hedgerows at high speed, bursting through them without exposing the vulnerable underbellies of the tanks. Until this happened, they could not get across the hedgerows. Ordered to help close the Falaise Gap and Argentan pocket which contained the German Seventh Army, the division finished the job near Putanges by 18 August. Six days later the outfit had sped through Courville and Chartres and was located at the banks of the Seine River. On the night of 25 August 1944 the crossing of the Seine by the division started; once over, the 3rd slugged its way across France, reaching Belgium on 2 September 1944. Liberated in the path of the division were Meaux, Soissons, Laon, Marle, Mons, Charleroi, Namur and Liege. It was at Mons that the division cut off 40,000 Wehrmacht troops and captured 8,000 prisoners. "Then the division began the first invasion of Germany since the days of Napoleon"[This quote needs a citation] is a claim often repeated and derives from 1947 U.S. Army literature that ignored earlier acts such as the 5th Armored Division's reconnaissance into Germany on 11 September 1944, French troops entering the Saarland in September 1939 during the Saar Offensive, and the entry into Germany by imperial Russian troops in 1914 and of the French invasion of Alsace in August 1914. Division troops crossing the Siegfried line to Germany. On 10 September 1944, the Spearhead Division fired what it claimed was the first American field artillery shell of the war onto German soil. Two days later, it passed the German border and soon breached the Siegfried Line, taking part in the Battle of Hurtgen Forest. The 3d Armored Division continued fighting during the Battle of the Bulge, far north of the deepest German penetration. The division fought south in an attack designed to help wipe out the bulge and bring First Army's line abreast of Patton's Third Army fighting northward toward Houffalize. It severed a vital highway leading to St. Vith and later reached Lierneux, Belgium, where it halted to refit. After a month of rest the division continued its offensive to the east, and on 26 February, Spearhead rolled back inside Germany as both Combat Commands bolted across the Roer River and seized several towns, crossed the Erft Canal, and at last broke through to the Rhine River to capture Cologne by 7 March. Two weeks later it crossed the Rhine south of Cologne at Honnef. On 31 March, the commander of the division, Major General Maurice Rose, rounded a corner in his jeep and found himself face to face with a German tank. As he withdrew his pistol either to throw it to the ground or in an attempt to fight back, a young German tank commander, apparently misunderstanding Rose's intentions, shot the general. Beyond Cologne the division swept up Paderborn in its advance, to shut the back door to the Ruhr Pocket. In April, the division crossed the Saale River, north of Halle, and sped on toward the Elbe River. On 11 April 1945, the 3d Armored discovered the Dora-Mittelbau concentration camp. The division first arrived on the scene, reporting back to headquarters that it had uncovered a large concentration camp near the town of Nordhausen. Requesting help from the 104th Infantry Division, the 3d immediately began transporting some 250 ill and starving prisoners to nearby hospital facilities. The last major fighting in the war for the division was the Battle of Dessau, which the division captured on 23 April 1945 after three days of combat. Following the action at Dessau, the division moved into corps reserve at Sangerhausen. Occupational duty near Langen was given the division following V-E Day, a role it filled until inactivation on 10 November 1945. 3rd Armored Division M-60A3 tanks and armored personnel carriers near the Sembach Air Base exit ramp. The division was reactivated on 15 July 1947 at Fort Knox, Kentucky to act as training formation. In 1955 the 3d Armored Division was reorganized for combat and shipped to Germany the next year. It replaced the 4th Infantry Division under a program called Operation Gyroscope. It was the first U.S. armored division to be stationed east of the Rhine River in the Cold War. The 3d Armored Division, headquartered at Frankfurt am Main, served in Cold War Germany for approximately 36 years, from May 1956 to July 1992, with the exception of the time spent in Saudi Arabia and Iraq during the leadup to and Gulf War. The three main combat forces headquarters for the 3rd AD were, (1) Ayers Kaserne at Kirch-Goens and Schloss Kaserne at Butzbach (The forces at those kasernes initially formed Combat Command "A" [CCA] of the 3d Armored Division. (2) Coleman Kaserne at Gelnhausen (CCB/2d Brigade); and (3) Ray Barracks at Friedberg (CCC/3d Brigade). The 3d Armored's primary mission during the May 1956 to July 1992 period was, in the event of war, to defend the Fulda Gap, alongside other NATO elements, against numerically superior Warsaw Pact forces. In June 1962 USAREUR maxed out its Cold War troop strength; that number was never achieved again. Also in June 1962 the nuclear warheads for the Davy Crocketts arrived in USAREUR (3d AD combat maneuver battalions were issued Davy Crocketts). In late October 1962 during the Cuban Missile Crisis there was no hotline between Washington and Moscow; Soviet Forces, including those in the Group of Soviet Forces in Germany (GSFG), were placed on the highest alert level. Two of the five armies in the GSFG were positioned to advance through the Fulda Gap. These were the 8th Guards Army (three motor rifle divisions and one tank division) and 1st Guards Tank Army (four tank divisions and one motor rifle division). From 1963 the Reorganization Objective Army Division (ROAD) changes meant organizational changes within the 3d AD's three combat commands, plus a name changeover to "brigades" e.g. Combat Command A became 1st Brigade. To prepare their soldiers for an invasion, the 3d Armored Division's units frequently conducted field training in Bavaria at Hohenfels Training Center, Hohenfels, Bavaria; Wildflecken Training Center; and Grafenwöhr Training Center, conducting exercises of live fire, movement and communications. Throughout its time in Cold War Germany, beginning in mid-1956, the division would also frequently take to the German countryside for training maneuvers, including, beginning in January 1969, what became an annually staged war game Reforger, which simulated invasion of Western Europe by Warsaw Pact forces. Note: As indicated in the yearly issues during the Vietnam War of Annual Historical Summary - Headquarters United States Army, Europe and Seventh Army, the USAREUR training maneuver budgets dramatically dried up during the Vietnam War years. Significantly reduced training funds were first mentioned in the 1 January to 31 December 1966 edition of the USAREUR Annual Historical Summary. According to Karl Lowe in his www.usarmygermany.com article, in 1976 the army wanted to move the 2d Brigade's home station from Gelnhausen to Alsfeld, which lay in the Northern Advance Route for Soviet Forces out of the Fulda Gap; however the Germans wouldn't agree to a major share in building brigade facilities at Alsfeld, so the plan was dropped. At the peak of 1980s East/West tensions, as many as nineteen Soviet and East German divisions faced off against NATO forces in the area. Throughout the Cold War, the division headquarters company, the 503d Administrative Company, 503d Adjutant General Company, and 503d MP Company were based at Drake Kaserne, with 143d Signal Battalion and other support units stationed across the street at Edwards Kaserne in Frankfurt, West Germany. A number of its subunits were based in other Kasernes throughout the German state of Hessen, notably Ayers Kaserne (50° 28' 32.44" N 8° 38' 29.24" E) at Kirch-Goens and Schloss Kaserne at Butzbach (CCA/1st Brigade), Gelnhausen (CCB/2d Brigade), Ray Barracks at Friedberg (CCC/3d Brigade) and Fliegerhorst near Hanau (eventually converted to the division's Aviation Brigade). The NCO Academy contained two companies: Co. A was assigned to the medieval castle at Usingen-Kransburg, while Co. B was located in Butzbach. The division itself comprised an average of 15,000 soldiers, organized into three combat commands (CCs) later renamed brigades (ROAD reorganization in 1963), organizations of comparable size to the World War II combat commands. These brigades were individually manned by at least one battalion each of infantry, armor, and artillery, and various supporting units, notably including medical, engineer, and aviation elements. The division was also assigned the dedicated 533d Military Intelligence/CEWI (Combat Electronic Warfare and Intelligence) Battalion by 1980, replacing the 503d MI Company that previously supported the division intelligence staff. Most of the kasernes were located adjacent to or within German communities, leading to lively trade and interaction between soldiers and German civilians. A few, however, were somewhat remotely located, particularly Ayers Kaserne ("The Rock")(50° 28' 32.44" N 8° 38' 29.24" E), where the 1st Brigade was stationed, outside Kirch-Goens. The most famous soldier in the 3d Armored Division during the 1950s was Elvis Presley, assigned to Company A, 1st Medium Tank Battalion, 32d Armor, Combat Command C at Ray Barracks in Friedberg. After his time in service, Presley made a movie G.I. Blues in which he portrays a 3d Armored Division tank crewman with little field duty but with much opportunity for singing, particularly at Frankfurt. In real life Presley was promoted to Sgt E-5 near the end of his tour in Germany, without the prospect of attending the 3AD NCO Academy, although he had a reserve obligation after active duty. Maybe he could have attended a Reserve-sponsored NCO Academy after returning to CONUS. In the movie he wears the E5 insignia of a Spec 5 rather than a SGT E5. Colin Powell also served in the division. He was assigned to the 2d Armored Rifle Battalion, 48th Infantry, Combat Command B, Coleman Kaserne, Gelnhausen, between 1958 and 1960. It started out with his first Army command assignment, as an infantry platoon leader. By 1990, communism in eastern Europe collapsed, the two German states reunited, and the Soviet Army was being withdrawn back to the Soviet Union. With these events, the Cold War came to a peaceful conclusion, freeing U.S. Army units in Europe for other deployments. In response to the changing cold war scenario, 3AD was instructed to begin selective standing down of various division elements during the summer of 1990. Some units, for example the 3d Battalion, 5th Air Defense Artillery, had turned in equipment or cross-leveled with other 3AD units by August 1990, when momentous events in the Middle East developed. That month, Iraq invaded Kuwait, and soon after, President George H. W. Bush committed U.S. troops to the theater, first to defend Saudi Arabia, and then to eject Iraqi troops from Kuwait. Deployment of advance elements of 3AD began in December, with the remaining deploying units arriving by January. Units that had drawn down were replaced or augmented back to full strength. As an example, 3-5 ADA was replaced by the 8th Infantry Division's 5th Battalion, 3d Air Defense Artillery. Other units were attached to 3AD to bring it up to, and even beyond, full strength. 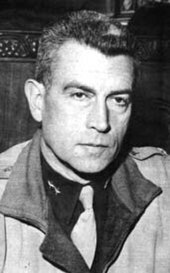 The 3d Armored Division, then commanded by Major General Paul Funk, was one of four U.S. heavy divisions deployed with VII Corps. The division and its equipment were shifted from Germany to Saudi Arabia, with in some cases, Army National Guard and Army Reserve elements taking over some of their duties in Germany, while in others, kasernes were left virtually empty. This massive redeployment was possible by the end of the Cold War. After redeployment, the division acclimated to the desert climate, and its troops faced new challenges in mobility, tactics and maintenance in a sandy and hot climate. Various National Guard and Army Reserve units were then attached to the division for the duration of the conflict, swelling the division's size to over 20,000 troops – 25% larger than during its time in Germany. The majority of the division's troops never received Desert Battle Dress Uniforms due to a shortage, and fought instead in lightweight summer "woodland pattern" uniforms, covered by tanker suits or chemical warfare protective MOPP suits. Finally, after months of training the division moved to the line of departure, alongside the 1st Armored Division on its left flank and the 2d Armored Cavalry Regiment on its right flank. While the Iraqi Army concentrated much of its defenses in and around Kuwait itself, the 3d AD and VII Corps launched a massive armored attack into Iraq, just to the west of Kuwait, taking the Iraqis completely by surprise. Scouts from 2d Brigade crossed on the afternoon of 23 February 1991 just after 1500 hours. Less than two hours later, they had penetrated several miles into Iraq and managed to capture over 200 prisoners. On 24 February, the official first day of action, the division as a whole swung into action as part of a coordinated attack by hundreds of thousands of allied troops. During the first day of battle, the 3d Armored Division pushed 18 miles into Iraq, taking over 200 prisoners. By dawn of the second day, an additional 50 prisoners had been taken, with scouts reporting enemy reinforcements moving to meet the division. At 1115 hours of the second day, all elements of the division were finally across the line of departure. The day was marked by hard pushing to penetrate deep and fast, striking for an objective south of Basra. In the course of its drive, various elements of the division engaged the enemy, taking prisoners, skirmishing, sometimes bypassing enemy strongholds to gain ground, other times engaging in full-scale battle. By nightfall of the second day, 3AD had driven 53 miles into Iraq, with dozens of enemy vehicles destroyed, hundreds of POWs captured, and was on the verge of achieving its first objective – an accomplishment that war planners had not anticipated. On the third day of combat, 26 February, the division closed in upon its objective and faced for the first time the Iraqi Republican Guard, a much stronger foe than the forces the division had first engaged, and less inclined to retreat or surrender. Opposing forces included the highly touted Republican Guard "Tawakalna" Division, the Iraqi 52nd Armored Division and elements of the 17th and the 10th Armored Divisions. The division engaged in full scale tank battles for the first time since World War II, and as one of the division's veterans states "There was more than enough action for everyone". Action continued after nightfall, and by 1840 hours, the ground and air elements of the 3d AD could report over 20 tanks, 14 APCs, several trucks and some artillery pieces destroyed. Unfortunately, that same evening, the 4th Battalion, 32d Armor lost the division's first casualties in a Bradley Fighting Vehicle to 25mm cannon fire – with two soldiers killed and three wounded. During the night, both darkness and sandstorms hampered soldiers' visibility, but thermal sighting systems on board the M1A1 Abrams tanks and Bradleys allowed gunners to knock out Iraqi targets. By the fourth day, the division reached its objective, and pursued its now retreating enemy. The division turned east, into Kuwait, continuing to inflict heavy casualties and capture troops as it rolled forward, often hitting new units whose defensive berms and foxholes faced south from their northern flank, rendering their defenses ineffective. By nightfall, forces facing 3AD had been virtually eliminated, with their remnants in full retreat. By the fifth day of combat, the division had achieved all objectives and continued to push east to block Iraqi retreat from Kuwait, conducting mopping up operations. One hundred hours after the ground campaign started, President Bush declared a ceasefire. On 28 February the U.S. 3d Armored Division cleared Objective Dorset after meeting stiff resistance and destroying more than 300 enemy vehicles. The 3d Brigade, 3d Armored Division also captured 2,500 enemy prisoners. At the height of the battle, the 3d Armored Division included 32 battalions and 20,533 personnel. It was the largest coalition division in the Gulf War and the largest U.S. armored division in history. In its moving arsenal were 360 Abrams main battle tanks, 340 Bradley Fighting Vehicles, 128 self-propelled 155 mm howitzers, 27 Apache attack helicopters, 9 multiple-launch rocket systems, and more. During the ground war, 3d AD destroyed hundreds of Iraqi tanks and vehicles, and captured more than 2,400 Iraqi prisoners. The 3rd AD served at the Battle of 73 Easting and the Battle of Norfolk. The 3rd Armored Division had three M1A1 Abrams tanks damaged during combat operations. The 3rd Armored Division suffered 15 soldiers killed between December 1990 and late February 1991. Approximately 7 of the soldiers were killed in action and another 27 soldiers from the division were wounded in action during combat operations. Following the war, 3d Armored Division was one of the first units rotated to Camp Doha, Kuwait, providing protection to Kuwait as it rebuilt. Following Desert Storm, a number of the division's units were transferred to the 1st Armored Division. On 17 January 1992, the 3d Armored Division officially ceased operations in Germany, with a ceremony in Frankfurt at Division Headquarters, Drake Kaserne. "Sir, this is my final salute. Mission accomplished," said Maj. Gen. Jerry Rutherford, the division commander. Rutherford preceded the final salute to General Crosbie E. Saint, USAREUR Commander, with a loudly shouted "Spearhead!" The division colors were then returned to the United States, with the 3d AD still officially active, since Army Regulations state that Divisional "Casing of the Colors" cannot occur on foreign soil. Official retirement took place at Fort Knox, on 17 October 1992. In attendance at the ceremony were several former Spearhead commanding generals, and division veterans from all eras. In a traditional ceremony, Command Sgt. Major Richard L. Ross, holding the division color with battle streamers, passed it to General Frederick M. Franks, Jr., completing the official retirement of the division, and the 3d Armored Division was removed from the official force structure of the U.S. Army. With the end of the Cold War, several of the division's overseas Kasernes were transferred to other units, particularly the 1st Armored Division. Over time, many were closed, fell into disrepair and were eventually demolished. Some 3d Armored units were also transferred to the 1st Armored, notably the 2nd Battalion, 3rd Field Artillery, later to become semi-famous as the unit portrayed in Gunner Palace. The 1st Battalion, 32nd Armor now resides at Fort Campbell, Kentucky as part of the 101st Airborne Division (Air Assault). The unit was reorganized as the 1st Squadron, 3rd Cavalry Regiment, and is assigned to the 1st Brigade Combat Team of the 101st Airborne Division (Air Assault) as its organic Reconnaissance, Surveillance, and Target Acquisition (RSTA) element. The 1st Battalion, 33d Armor also calls Fort Campbell and the 101st Airborne Division (Air Assault) home. The 1st Battalion, 33d Armor was reorganized as the 1st Squadron, 33d Cavalry Regiment and is assigned to the 3d Brigade Combat Team of the 101st Airborne Division (Air Assault). The 4th Squadron, 7th Cavalry is now part of 1st Brigade, 2d Infantry Division. Additionally, the lineage of the 122d Support Battalion (Main) from the Division Support Command was reactivated at Fort Bragg and assigned to the Combat Aviation Brigade, 82d Airborne Division as the 122d Support Battalion (Aviation). Also, the 54th Support Battalion (Main) was reactivated on 16 September 1994 as the 54th Support Battalion (Base) of the 80th Support Group (Area). The 3rd Armored Division had thirty-nine commanders over the course of its history, many of whom went on to four star rank. Cooper, Belton Y. (1998). Death Traps: The Survival of an American Armored Division in World War II. Navato, CA: Presidio Press. ISBN 0-89141-670-6. OCLC 38753044. A unique look at the war from a maintenance officer's perspective. Rolling Thunder: The True Story of the Third Armored Division (2002) – A History Channel documentary detailing the history of the division from birth to the 1990s. Man, Moment, Machine (season 1, episode 4): "Stormin' Norman and the Abrams Tank" – Featuring footage of the 3rd AD in the Gulf War, and interviews with 3AD tankers. Fury (2014 film) - a 2014 American-British war film written and directed by David Ayer. ^ Haldeman, Rob. "644th Tank Destroyer Battalion". 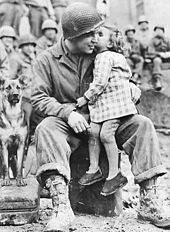 ^ Third Armored Division Association; Members of the Division; Family and Friends. "Third Armored Division Association Archives: An Inventory at the University of Illinois Archives". ^ "3rd Armored Div. - Gulf War - 100-Hour Storm". www.3ad.com. Retrieved 26 August 2015. ^ Scales, Brig. Gen. Robert H.: Certain Victory. Brassey's, 1994, p. 279. ^ "54th Support Battalion". Archived from the original on 3 June 2013. Retrieved 13 June 2012. ^ "Commanders of the 3d Armored Division 1941-1992". Archived from the original on 28 September 2007. Retrieved 14 September 2007. ^ "Rolling Thunder: The True Story Of The 3rd Armored Division DVD". A&E Television Networks. Trauschweizer, Ingo. The Cold War U.S. Army: Building Deterrence for Limited War. Univ. Press of Kansas (2008). ISBN 978-0-7006-1578-0. Bourque, Stephen A. (2001). Jayhawk! The 7th Corps in the Persian Gulf War. Center of Military History, United States Army. LCCN 2001028533. OCLC 51313637. Third Armored Division (1945). Spearhead in the West, 1941-45 (PDF). Frankfurt am Main: Franz Jos. Henrich, Druckerei und Verlag. OCLC 1262878 – via Central Connecticut State University. Wikimedia Commons has media related to 3rd Armored Division (United States). 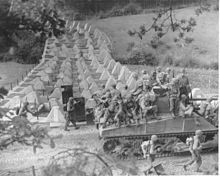 3AD.com – The 3rd Armored Division History Foundation – Covering 1941 to 1992 with high-quality photos, feature articles, documents, audio, and more. Includes, for example, complete text of the 260-page 3AD World War II history "Spearhead in the West" ; audio of President Kennedy's speech to the troops in 1963; details on 3AD Cold War nuclear weapons; Spearhead Newspaper's Gulf War reports; and a look at Elvis Presley's Army days. Association of 3d Armored Division Veterans (All-era group) – Extensive historical information, personal photos, and featuring a roster of Operation Desert Storm troops. 3rd Armored Division Association Archives at the University of Illinois. Text-only listings of their large World War II collection, which must be visited in person. 3rd AD Unit page on Military.com. Roll of Honor of the 3d Armored Division during WWII. This page was last edited on 21 April 2019, at 11:13 (UTC).